Here is an excellent go-to spring breakfast idea that will be sure to start your day off right! 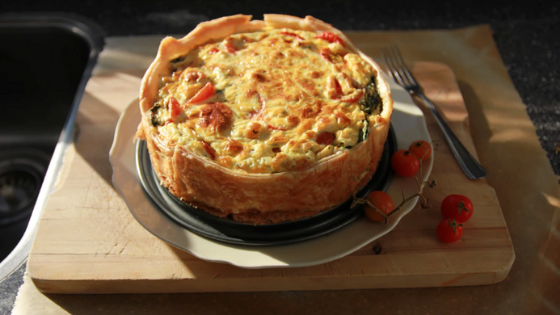 Quiche is loaded with fresh veggies and includes eggs, which are always a hit around this time of year! Here’s how to make the perfect spring quiche for your upcoming brunch with friends, a holiday get-together, or a day at home. Saute the olive oil, peppers, and mushrooms in a pan on medium-high heat for 2 minutes. Add in the asparagus, and cook for 4-6 more minutes. Add the spinach and cook until wilted. Set veggie mixture aside. Put the pie crust in a pie pan, add the veggies in a layer on the bottom, and set it aside. Whisk the eggs, nutmeg, salt, and pepper together. Sprinkle the cheese over the eggs and veggies. Bake your quiche for 35-40 minutes. The top should appear golden brown before cooling 5 minutes and serving. * If the veggies listed here aren’t your favorites, consider using other alternatives that you prefer. Some ideas: Zucchini, yellow squash, green or white onions, yellow or orange bell peppers, carrots, etc. Our Stamford apartments all have comfortable, well-outfitted kitchens to make your spring cooking a breeze. Interested in relocating to Stamford or looking for a new apartment in the area? We’re here to help! Contact our office at your convenience to find out what floor plans are still available.